Today, cardiovascular diseases, such as heart attacks and heart failure, have become epidemics in the United States and around the world. Despite the pervasiveness of these issues, one of the major barriers to alleviating these problems is education – on both how to lead a healthier lifestyle as a preventative measure, and how to treat or live with these diseases after their onset. EECP® Therapy is a non-invasive treatment for ischemic heart diseases that is proving to be an effective and economic alternative to traditional invasive procedures. 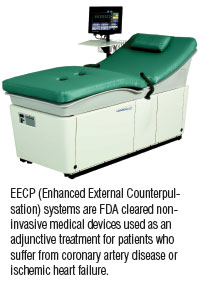 Enhanced External Counterpulsation, or EECP® Therapy, is an FDA-cleared, non-invasive technology manufactured and marketed by VasoMedical Inc., and is used to treat ischemic cardiovascular diseases, such as angina and congestive heart failure. This outpatient therapy is delivered to the patient, who lies on a treatment bed, with compressive cuffs wrapped around the calves, thighs, and buttocks. Synchronized to the patient's heart rhythm, the cuffs inflate and deflate to increase diastolic pressure and reduce systolic workload of the heart, thereby improving blood flow to the heart muscle and increasing cardiovascular efficiency. While the current technology is innovative and unique, its beginnings started almost 60 years ago. During the 1950s, cardiovascular surgeons identified that coronary arteries in the heart receive blood flow when the heart is at rest in the diastolic phase of the cardiac cycle, and increased aortic pressure during diastole will significantly improve coronary perfusion. Counterpulsation is the augmentation of aortic pressure in opposite synchrony with the heart. Early in the 1960s a device called the Counterpulsator was developed. This device withdrew some blood from the femoral artery during systole and re-injected it during diastole to increase blood flow to the heart. This rudimentary device, though minimally efficient, became the forerunner of more advanced first generation technologies such as the intra-aortic balloon pump (the internal counterpulsation device) and the hydraulic external counterpulsation device in 1968. While the invasive and complex intra-aortic balloon pump remains an effective procedure in acute settings, largely overlooked in the 1970s and 1980s, due to the emergence of coronary bypass surgery and angioplasty, was the development of external counterpulsation. Researchers in the United States and China refined the technology to become today's external counterpulsation devices with multiple air bladders inflating sequentially and deflating simultaneously. With its patented pneumatic system and proprietary control algorithm, VasoMedical Inc., a Long Island, N.Y.-based company, acquired marketing clearance from the U.S. Food and Drug Administration (FDA) for its Enhanced External Counterpulsation (or EECP®) Therapy system in 1995. Today, EECP® is considered the gold standard of ECP Therapy around the world; in fact, physicians often use the trademarked EECP® as the default name for ECP. Currently, VasoMedical offers two types of EECP® Therapy systems to accommodate different application needs: an all-in-one type and a mobile type. The Lumenair EECP® Therapy system and the AngioNew-VI EECP® Therapy system are all-in-one systems designed for use in hospitals, treatment centers, and physicians' offices. The AngioNew-V is a mobile system that provides flexibility to physicians who may have variable demands for the therapy. 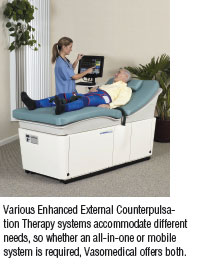 VasoMedical's EECP® Therapy systems are manufactured in two company owned sites. The first site is at the company's main facility in Westbury, NY, where the company has been located for 17 years. The second facility is Life Enhancement Technology Ltd., a wholly owned subsidiary of VasoMedical, in Foshan, China. Both facilities are cGMP compliant and ISO 13485 certified, and manufacture the same systems, using the same quality process. These manufacturing facilities have enabled VasoMedical to better serve and support its growing international market – as they are virtually operating in a combined capacity 24 hours a day. It takes each facility approximately a week, from start to ready-to-ship, for the manufacture and testing of a Lumenair EECP® Therapy system, VasoMedical's top-of-the-line model. Built on a steel frame, which supports an air compressor, welded reservoir tanks, valve assemblies, power supply, and signal module, the system is an all-in-one design, enclosed in high-tech, space saving molded exterior. An ergonomically designed mattress provides patient comfort while also allowing the operator to access the patient conveniently. Additionally, the system has an easy-to-use touch screen for monitoring and controlling the treatment process. There have been more than 160 peer-reviewed papers on EECP® Therapy, documenting its safety and immediate as well as long-term efficacy and verifying its mechanisms of action. VasoMedical also sponsored two independent EECP® patient registries with data recorded for more than 8,000 patients in total, providing more insights on the high success rate (70% to 80%) of this therapy. With the ongoing and continuous publication of scientific and clinical articles, EECP® Therapy is becoming better understood by physicians and better known to patients. This awareness is leading to greater acceptance of the Therapy as a safe and effective non-invasive adjunctive therapy for ischemic heart disease. The result is an increase in patient demand, physician interest, and more importantly, the improved long-term health of the patient. It has been long conjectured that, since EECP® improves blood flow to all organs of the body, it should provide positive effects for many other ischemia related conditions. While these non-cardiac indications are not yet FDA-cleared, there has been a large amount of evidence published that EECP® is effective in treating ischemic stroke, vascular dementia, diabetes and pre-diabetes, etc., including evidence from controlled and randomized studies. In fact, in certain countries, the use of EECP® currently treats these conditions. Expectations are that once there is FDA clearance for these additional indications, there will be a much broader utilization of EECP® Therapy, through an expansion of the market and greater availability to many more patients. In addition to its proven medical impact, the use of EECP® systems as an alternative or adjunctive treatment results in lower medical costs through the reduction of re-hospitalizations for congestive heart failure and other diagnoses. For these reasons, EECP® Therapy is well positioned to be a highly successful and economic choice of treatment. As this information travels around the world through publications, global conferences, and trade shows, more international markets are beginning to use these EECP® systems and develop treatment programs to satisfy demand. With a greater understanding of EECP® Therapy's functionality and clinical evidence demonstrating successful results, VasoMedical predicts a significant potential for growth in 2013 and beyond. VasoMedical, Inc. is a diversified medical technology company specializing in the manufacture and sale of medical devices and in the domestic sale of diagnostic imaging products. The Company's main proprietary products are EECP® Therapy systems, the gold standard of ECP treatment. The Company operates through three wholly owned subsidiaries: VasoSolutions, VasoMedical Global and VasoHealthcare. VasoSolutions manages and coordinates the design, manufacture and sales of EECP® Therapy systems, and other medical equipment operations; VasoMedical Global operates the Company's China-based subsidiaries; and VasoHealthcare is the operating subsidiary for the exclusive sales representation of GE Healthcare diagnostic imaging products in certain market segments. Additional information is available on the Company's website at www.vasomedical.com. Except for historical information contained in this release, the matters discussed are forward-looking statements that involve risks and uncertainties. When used in this release, words such as “anticipates”, “believes”, “could”, “estimates”, “expects”, “may”, “plans”, “potential” and “intends” and similar expressions, as they relate to the Company or its management, identify forward-looking statements. Such forward-looking statements are based on the beliefs of the Company's management, as well as assumptions made by and information currently available to the Company's management. Among the factors that could cause actual results to differ materially are the following: the effect of business and economic conditions; the effect of the dramatic changes taking place in the healthcare environment; the impact of competitive procedures and products and their pricing; medical insurance reimbursement policies; unexpected manufacturing or supplier problems; unforeseen difficulties and delays in the conduct of clinical trials and other product development programs; the actions of regulatory authorities and third-party payers in the United States and overseas; uncertainties about the acceptance of a novel therapeutic modality by the medical community; continuation of the GEHC agreement; and the risk factors reported from time to time in the Company's SEC reports. The Company undertakes no obligation to update forward-looking statements as a result of future events or developments.